Day 1 – thankful for Ruby and adoption for making us a family. Day 2 – thankful for Jed – best husband and father. Day 3 – thankful for sometimes waking up before the baby. Day 4 – thankful for books. I can’t remember a time when I didn’t read and watching Ruby play with hers is the best gift. Day 5 – thankful for healthcare coverage for my entire family and a clean bill of health for all. Day 6 – thankful for sweater dresses and boot socks. Day 7 – so thankful for my It’s All Yoga family. Day 8 – thankful for generous friends. Day 9 – thankful for a union job and parental leave so we can be at home to bond with our baby without worrying about our jobs. Day 10 – thankful for massage. Day 11 – thankful for the people in the armed services and their dedicated service to this country. Day 12 – thankful for social media because it keeps me in touch with the outside world. Day 13 – thankful for year round farmer’s markets. Day 14 – thankful for long, hot baths after the baby goes to sleep. Day 15 – thankful for music that inspires me to sing out loud. Day 16 – thankful for the restorative powers of showers. Day 17 – thankful for uninterrupted sleep in a way I never dreamed possible. Day 18 – thankful for daily account summaries from my bank which remind me I’m not completely broke. Day 19 – thankful for warm cozy blankets for naps on cool days. Day 20 – thankful for central heat (and air). Day 21 – thankful for early morning walks with lovely friends. Day 22 – thankful for all the blogs I read and the Google Reader to keep them organized. Day 23 – thankful for my yoga props: bolster, eye bag, strap, blankets, mat. Day 24 – thankful for Ruby’s birth family. Our family wouldn’t be complete without their generosity. Day 25 – thankful for the middle path. Day 26 – thankful for whole days with nothing planned. Day 27 – thankful for free shipping. Day 28 – thankful for our house cleaning fairies. Day 29 – thankful for YOU, my readers. 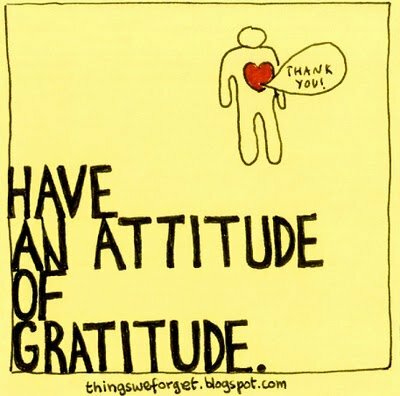 Day 30 – thankful for It’s All Yoga for the Attitude of Gratitude inspiration. A special thank you to Amy Shearn over at The Oprah Life Life blog for the Attitude of Gratitude post. Want to see where it all started? This entry was posted in A Yoga Story, Life as a Mama, Life At Home + The Neighborhood, Projects, Self-Care and tagged Attitude of Gratitude, gratitude, It's All Yoga, little things, November, One sentence journal, recap, Sacramento, thankful, Thanksgiving, yoga by Teacher Goes Back to School. Bookmark the permalink.